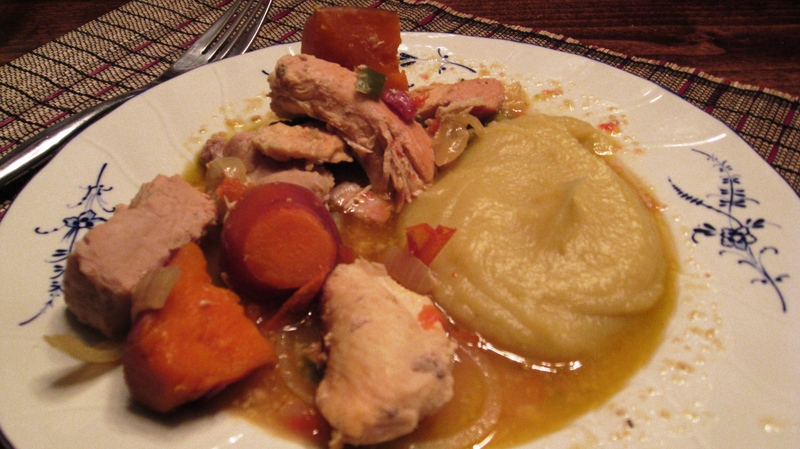 Sancocho is a Colombian soupy dish filled with meats, veggies, yucca, potatoes. We used to make Sancocho all the time before smartening up and eating paleo/primal. He surprised me with this most interesting and slightly naughty spin on traditional Sancocho. He is amazing with his surprise creations. Put all ingredients into the crock-pot and cook on low for at least 8 hours. I had to hit the road very early this morning while he was still finishing his coffee. Henry put all ingredients into the pot before leaving for work, by the time I got home and entered the house, I smelled the wonderful aroma of dinner cooking, and it put a smile on my face. I did not have to cook; he gave me the night off. 🙂 I had no stress and I could go to spin class, and still enjoy our family visiting for their last week and just enjoy each other’s company. We love our crock-pot! What is the puree on the side? I have a family size crockpot, and even without adding the chicken and meat, ran out of room. Are these measurements accurate? If so, what size crockpot did you use? I also did not seem to have nearly enough liquid.